Welcome to GanGan's Little Shop of Treasures. We sell something for everyone! 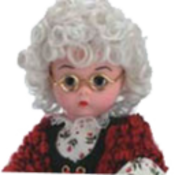 Antiques, collectibles, glassware, carnival glass, Disney,Coca-Cola, Roy Rogers, Gone with the Wind, Snow Babies, toys,household items, electronics, photo equipment ,new and used items and much, much more. Come on in, you never know what you might find! Being collectors for years , we will be listing very rare and hard to find items from time to time so check back often. We will also add new finds for your shopping pleasures! We have just started to acquire liquidation items, estate sale items and some great auction items!!! Our new finds will be described to the best of our ability and noted as personal or purchased. We are a pet friendly home but take extra care in packaging our items.Lots of great prices.. and great finds. We are proud and pleased to be able to pass great savings on to YOU! We have really enjoyed being here on Bonanza and have met some wonderful people and found some super deals! Look around, find something you have always wanted and buy it from the internets friendliest site. If there is something special on your wish list that you can't find, email us 'cause we just might have it! Add us to your favorites and check in often. You are always welcome at GanGan's! If you find you need any help, give us a shout and we will jump in and do the best we can to get you what you need. Great news.. Gan is on the mend and no surgery in sight! Feeling great and gonna be listing lots of awesome finds. GanGan doesn't have any items in their booth! GanGan is such a special person to me!! She is always there for you when times are bad and then when times are better she is there again. I think of her all the time. So wonderful to have her here on Bonanza again!! I think every one here on bonanzle knows GanGan, she is one of the most genuine people I have had the honor to buy from, sell to and be friends with. What a great friend and lady! A true asset to the bonanzle community! Helpful and willing to help! GanGan is a true Professional, trustworthy, High Qulaity Products at the right Price. Customer Service and Satisfaction is #1. Also a great assett to the Bonanzle community. Gives her time and help to everyone without question. A true “Angel” I highly recommend this person to everyone. I have known GanGan for several years and I love her like a sister, she is very honest and always willing to go out of her way to help someone. she is a person that makes Bonanzle proud. I highly recommend her. What a nice seller! And she lives near me too! Awesome! Will definitely shop her again! She even sent a free gift for my little granddaughter! A pure delight! The kind of Bonanzler I hope to be! Always trust this lady! Gan Gan is the Best of the Best here on Bonanzle. GanGan is kind, considerate, thoughtful and always there to lend a helping hand. She goes out her way to make someones day bad turn out to be good. She has a wonderful sense of humor and the best hostess in the Bonanzle community. I have been blessed to have gotten to know her on a personal level and will remains friends with her many years to come. Bonanzle couldn’t do without her!!! She is just the best. Gan Gan is truly such a sweet lady and a true asset to the Bonanzle community, she helps so many and she Rocks this website by being such an awesome auctioneer, I feel truly Blessed to have met her and she has become a Wonderful Friend!!! God Bless you Gan Gan!!! Gangan is a great seller. I have the pleasure of purchasing from them a few times and have always been satisfied. Just recently, I ordered a mystery box from gangan, and I have ordered dozens of mystery boxes from different people, this is the only seller who took a few extra minutes to look at my wishlist and add something from my wishlist. Very commendable. I highly recommend gangan to all. You really can not get better customer service. GanGan is been such a blessing to me since I have been here. She has helped me find my way and given great sound advice! She is a wonderful, trustworthy seller and an awesome lady!! She is an asset to Bonanzle as well as an asset in my life!! Gan is such a wonderful person. I have known her since the day she was born and am proud to have her as a member of my family. She has always been kind, caring, loving and such a special giving person. My life has been blessed with time we have spent together. GanGan is a delightful person. Better known to me as DoubleGan! Wonderful seller and buyer! Always willing to lead a helping hand to anyone…fun to tease too…lol All around great person! GanGan is such a sweet lady and an oustanding member of the Bonanzle family. She is truly and asset to this community her family and her friends!!!! She has not only great items but is always willing to help others! GanGan has got to be one of the sweetest folks and so helpful. I have seen her helping with other booths when they have auctions. Always so nice and polite. She is a great asset to Bonanzle. GanGan is a Super nice Lady she has a beautiful booth with Great prices. She is very helpful when someone needs a hand.It a pleasure to know her. She is One of the Best here on Bonanzle. What can I possibly say about Gan Gan that hasn’t been said..She is one of the best.. I’m so proud to be in her circle of friends..She has a wonderful kind heart..surprised me one time with a set of mugs that her and I were bidding on..she won them and sent to me..I love her..Stay who you are Gan.. Although there are literally thousands of people and services on the Internet, there are only a few that I personally endorse. I feel Honored just knowing her. There are few people that I hold in as high regard as I do her, and although I have only known her a short while, I consider Her a friend. GanGan treats everyone with equal courtesy, respect and regard. She is a great person to deal with both as a buyer, and a seller. And for those reasons, I highly recommend GanGan’s Little Shop Of Treasures to all. Terrific Seller. Always a Pleasure no Matter what I will be doing more business with her in the future! Many Blessings! GanGan is a Super Seller & Customer! Great items and a Pleasure to do Business with! Fast Shipper & Payer! Recommended to All! GanGan is one of the most genuine people I have ever had the pleasure of dealing with! She is a wonderful asset to Bonanzle & her fellow Bonanzlers! Great to deal with and has become a fast friend! One of the sweetest and most caring people I have encountered here at bonanzle! It is truly a honor to get to know you and share the joys of selling and buying with you each and every day! GanGan is very easy to deal with….I 100% recommend this seller! Truly an asset to Bonanzle. A wonderful person to deal with. This seller is VERY HIGLY recommended. She is not only an asset to Bonanzle, but an asset in my life as well. I feel it an honor and privilege to know her. She is very caring and genuine and my life has been touched by her presence here. GanGan, is one of these BEST sellers and buyers on Bonanzle Today!! She is a pure joy to have as a customer, but she is so much more… she has been a true friend since I’ve been here. She is friendly, caring and a person who is genuine. Thank you Gan! Great bonanzler! An asset to bonanzle! Fast payment with great communication! Great seller that I have bought from many times! GanGan has some marvellous items here. Haven’t gotten to know her personally yet, but I’m looking forward to that opportunity. She’s from an area with a lot of great, ethical sellers! !